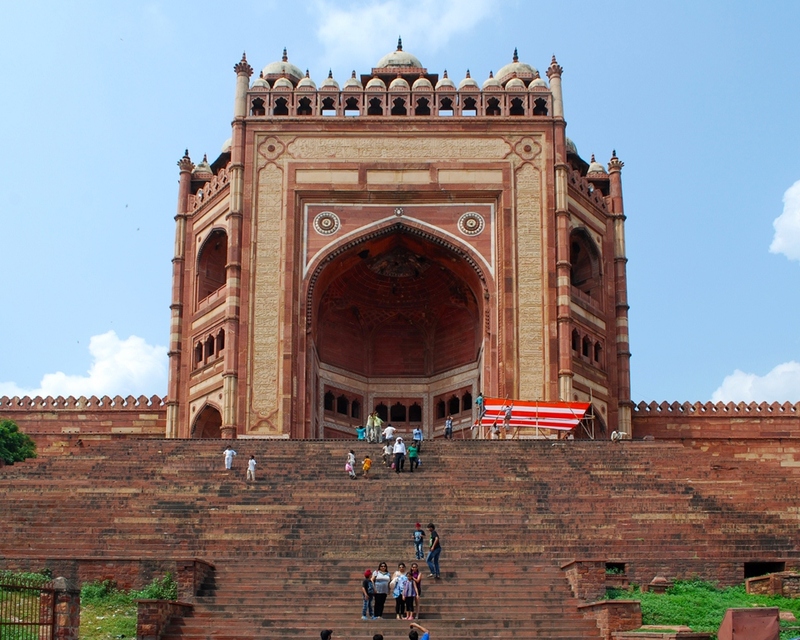 Buland Darwaza is a triumphal gateway built by Akbar about 25 years after the completion of the Jami Masjid. The southern gateway to the mosque courtyard was demolished and replaced with this monument to commemorate Akbar’s victorious campaign in the Deccan. The gateway is 134’ high, approached by a steep flight of steps 42’ high. Thus, the total height of the structure comes out to be 176’ above the roadway. The structure is 130’ wide and 123’ deep. The structure may be resolved into two aspects, the frontal and highest aspect forming the façade with the portal and the back view consisting of a lower and plainer portion intruding into the mosque courtyard. The façade is embowed by the means of three planes comprising a large central face and a lesser one on each side receding at an angle. The central plane is 86’ wide and is rectangular in shape, the greater part of its surface occupied by and arched and domed recess whose semi-dome is carried on five surfaces in the form of a half-decagon down to the ground, with a human height doorway at the base. The smaller planes are in three levels with varied openings at each stage. The whole is crowned by a perforated parapet, behind which pillared kiosks break the skyline. 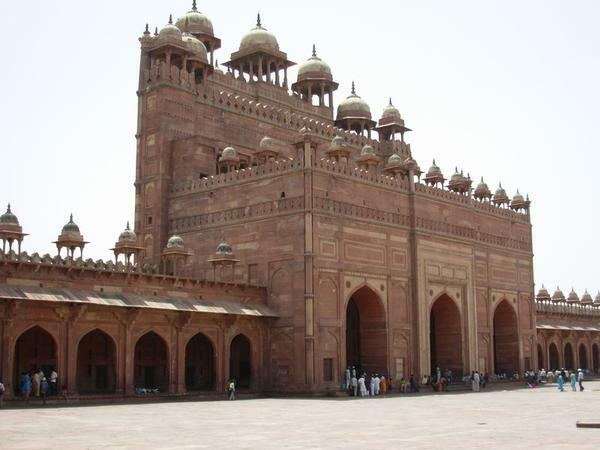 The rear aspect of the gateway is less pronounced, consisting of three arched entrances and a parapet in two stages to accord with the arches and colonnades of the mosque interior as far as possible. The main element of the decorative treatment of the outer façade is the wide border of the gateway emphasizing its rectangular formation, providing ample space for a continuous ornamental inscription.